DULUTH, MN--(Marketwire - Feb 6, 2012) - The final round of voting has opened for the top four bands vying for votes in the maurices (NASDAQ: ASNA) "Hometown Sound" nationwide band search. The leading hometown specialty store and fashion authority developed the search in partnership with PlayNetwork and Sonicbids. 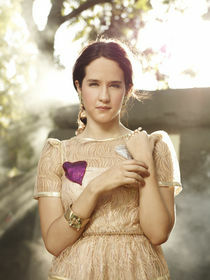 maurices today announces pop and alternative rock singer-songwriter Ximena Sariñana has joined the campaign as another partner artist. Along with hot global electro-soul popsters Graffiti6 and Grammy-winning rock band Evanescence, music from Ximena's latest album, Ximena Sariñana, will be featured in all maurices stores during the final round of the competition. The partner artists will also promote "Hometown Sound" to their fans, while explaining their experiences and offering advice to the contestants in "behind the scenes" interviews available on the band search contest microsite. "I'm so happy to be part of this contest that supports aspiring musicians and also for the opportunity to play at South by Southwest 2012," says Ximena. "Both Austin and SXSW hold sentimental value for me, since that's where I made my U.S. musical debut three years ago. To be back there as a partner artist for Hometown Sound is an honor." A panel of industry experts selected the top four bands from the top 50. The top four bands from all over the U.S. represent a wide range of musical styles. The finalists are: Grace Weber from Milwaukee, Wis.; Reverse Order from Hackettstown, NJ, Blue Bird from Omaha, Neb. ; and Katrina Stone from Denver, Colo.
From today through March 4, 2012, fans can vote for their favorite band by visiting their local maurices store and scanning the QR code or by visiting mauricesmusic.sonicbids.com. The band receiving the most votes will win maurices "Hometown Sound." Lisa Bartlett, maurices assistant vice president of marketing, says, "The four bands competing in this final round are not only amazingly talented, but their sound also fits perfectly with the maurices brand. We are so excited to see who wins and for that band to get the career-changing opportunity to play at SXSW." The grand prize winner will receive a trip to Los Angeles to shoot a music video with PlayNetwork. They'll also receive gifts from maurices, as well as the opportunity to perform at a maurices branded daytime showcase at South by Southwest (SXSW) in Austin, Texas on March, 2012, with Graffiti6 and other select partner artists. maurices, a division of Ascena Retail Group, Inc. (NASDAQ: ASNA), is the leading hometown specialty store and authority for the savvy, fashion-conscious girl with a twenty-something attitude. Today, maurices operates 800 stores in 44 states. maurices stands for fashion, quality, value and customer service. Offering sizes 1-26 in select stores and online, our styles are inspired by the girl in everyone, in every size. For store information and to shop online, visit maurices.com. PlayNetwork produces unrivaled media experiences for brands worldwide. PlayNetwork programs include music, messaging, video, web radio artist promotions and events, A/V systems, advertising networks, and commercial XM Satellite Radio. PlayNetwork aims to deliver experiences with the truest level of customization and integration across every touch point -- in-store, online and on-device. Founded in 1996, PlayNetwork is currently playing for over 75,000 media subscribers in 70 countries, reaching over 23 million people every day. For more information, visit playnetwork.com or xm4biz.com. Sonicbids is the leading matchmaking site for bands and promoters. Since its launch in 2001, Sonicbids has become the standard for submitting music to events and opportunities around the globe, counting as partners thousands of prominent events and festivals in North America, Europe, and Australia. Today, the Company boasts a registered membership base of 325,000 bands from over 100 different countries, who use the site daily to connect with 25,000 music "promoters" -- ranging from some of the world's largest music festivals and music conferences, to clubs, coffee houses, cruise ships, colleges, advertising agencies, brand managers, podcasters, music supervisors and other people looking to book, license or broadcast music. So far this year, bands and artists using Sonicbids booked close to 95,000 "gigs" through the site. Learn more at sonicbids.com. Ximena Sarinana, maurices Hometown Sound new partner artist. Watch as maurices Hometown Sound Partner Artist, Ximena Sarinana, gives a special message about maurices Hometown Sound.